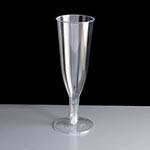 A range of disposable champagne glasses available. Perfect for any occasion when a glass will only be used once. Ideal uses include wedding receptions, BBQ's and garden parties. 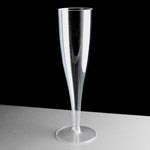 We also stock single use disposable champagne glasses, perfect for large events right down to the one off party or BBQ. 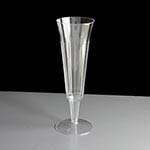 Inexpensive, these flutes represent excellent value for money; use once and throw away / recycle without the washing up afterwards - the perfect glass for a one off event.